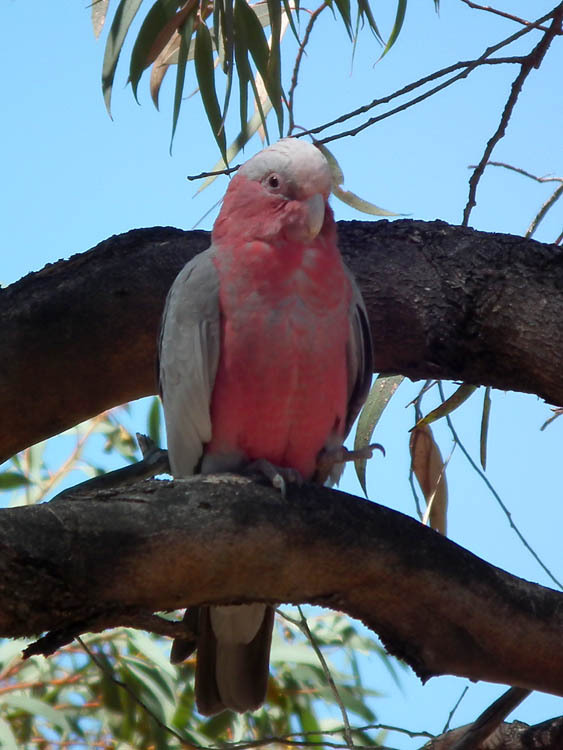 Galahs Eolophus roseicapilla are just about ubiquitous in Australia. 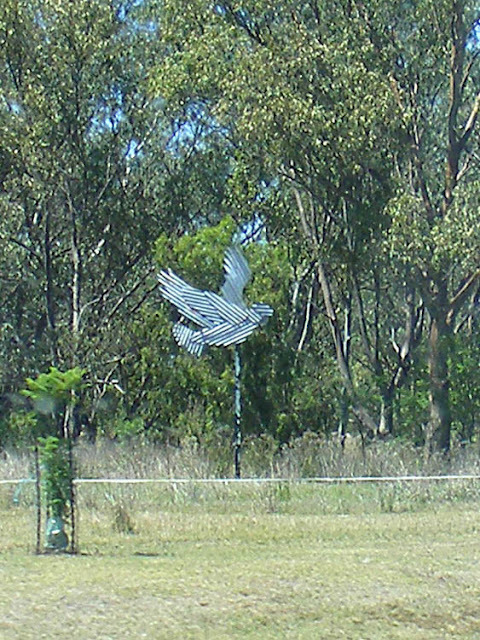 This common and widespread pink and grey cockatoo has adapted very nicely to white settlement, and is as likely to occur in an urban setting as in the outback, and everywhere in between. They have given their name to anyone who is a fool or does something stupid and you quite often hear rural folk describe someone they think is an idiot as a 'flamin' galah'. Galah is pronounced 'gull-ah' and the small western Queensland town of Gulargambone (usually pronounced so that it sounds like 'gull-ah-gah-bone') has adopted the galah as its emblem. On the road into town there are a dozen or so galah sculptures mounted on poles and made out of corrugated iron -- a common building material here for roofs and sheds. 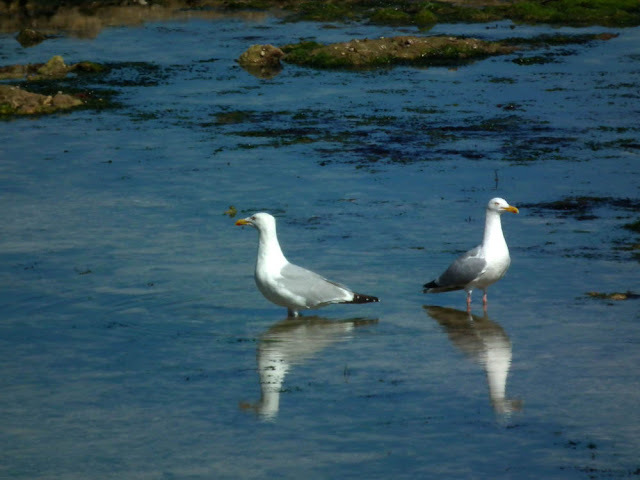 Ile de Ré Reflections: These two Herring Gulls Larus argentatus were clearly a pair. When one came to join the other in this rockpool they engaged in a short bout of pair bonding, posturing with beak clacking and head bobbing to greet one another. 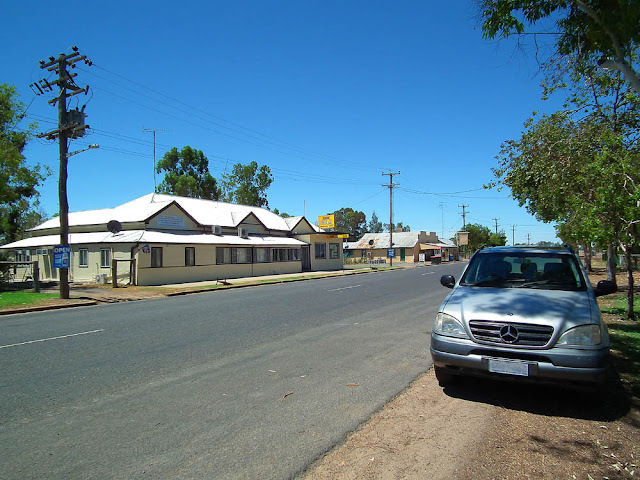 When we were overnighting in Moree last year we came out of the Bowls Club where we had dinner and could hear a cacophony of squawks, grunts and trumpeting. At first I thought it was Brolgas at the local wetland getting frisky. 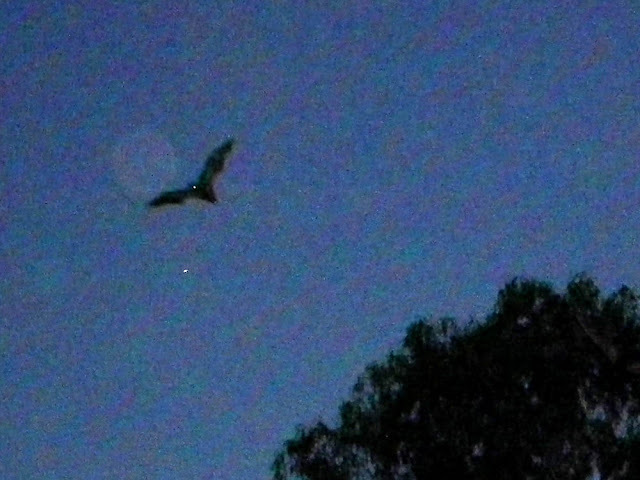 It was getting dark, but we went off to investigate nonetheless. 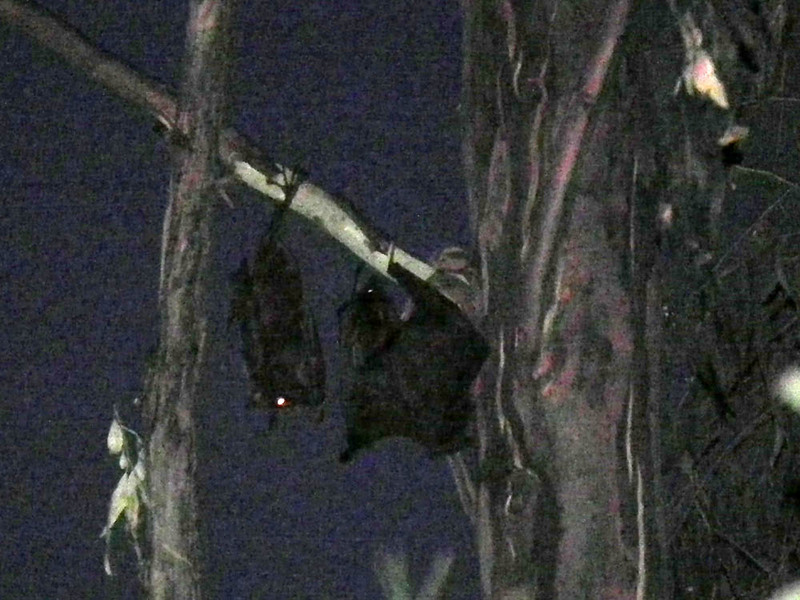 The row turned out to be flying foxes, a type of large bat, also known as fruit bats. 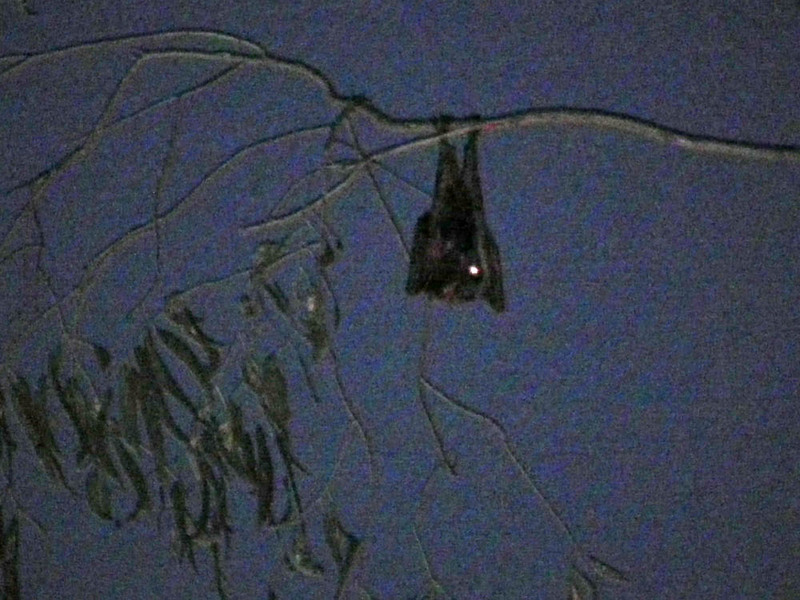 They were obviously preparing for the night's foraging, calling out to one another, squabbling and engaging in a bit of recreational gymnastics in the trees around the billabong. Because of the low light, we didn't get any very good photos, but we enjoyed watching them for a bit. I imagine they've outworn their welcome with anyone who lives nearby though -- they are noisy and stinky and they eat all your fruit and flowers. For a picture of flying foxes in daylight, see this one I took on a previous trip to Australia. 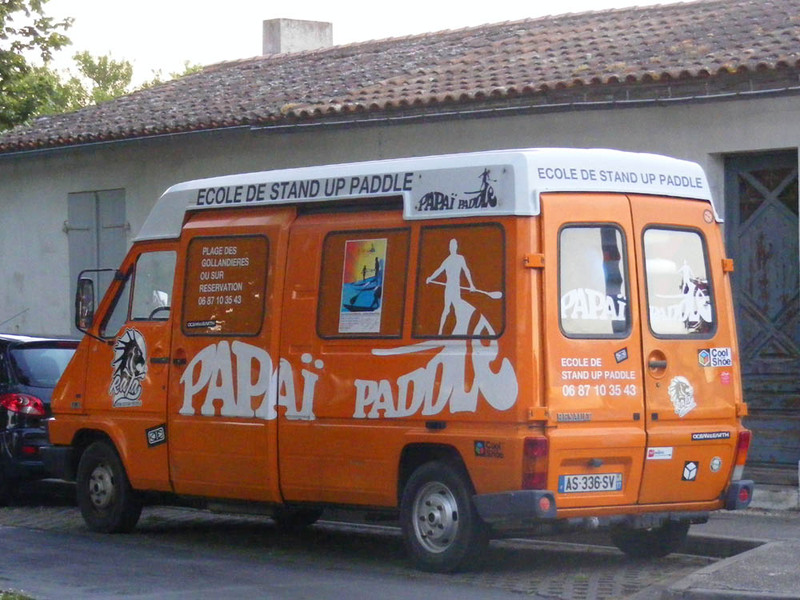 Ile de Ré Reflections: Proof that stand up paddle boarding is popular in France too. Vincent Roussely is the winemaker at Domaine du Clos Roussely in Angé. His ambition was always to be a winemaker, but the family estate had been sold. After he trained he went off to Australia to work for Hardy's in South Australia, making industrial wine to a formulaic recipe. Once he came back to France he knew he didn't want to do that again. 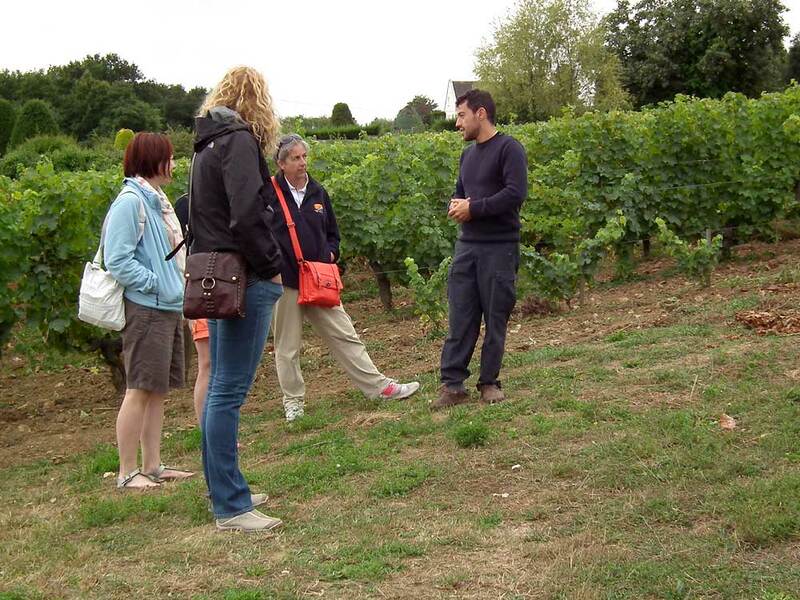 Vincent Roussely talking to me and some of our clients in his vineyard. When he got the opportunity he purchased back the family estate and converted it to organic production. He also modernised the winery, installing stainless steel tanks embedded in the tuffeau walls of the cellar and underground tanks in the floor. He has retained the grape chute his grandfather installed though, which delivers the grapes from the vineyard above down into the modern pneumatic press in the chai. Organically managed sauvignon blanc vines in September at Clos du Roussely. He makes an unusual range of still white wines from his sauvignon blanc grapes, from very dry to very sweet. 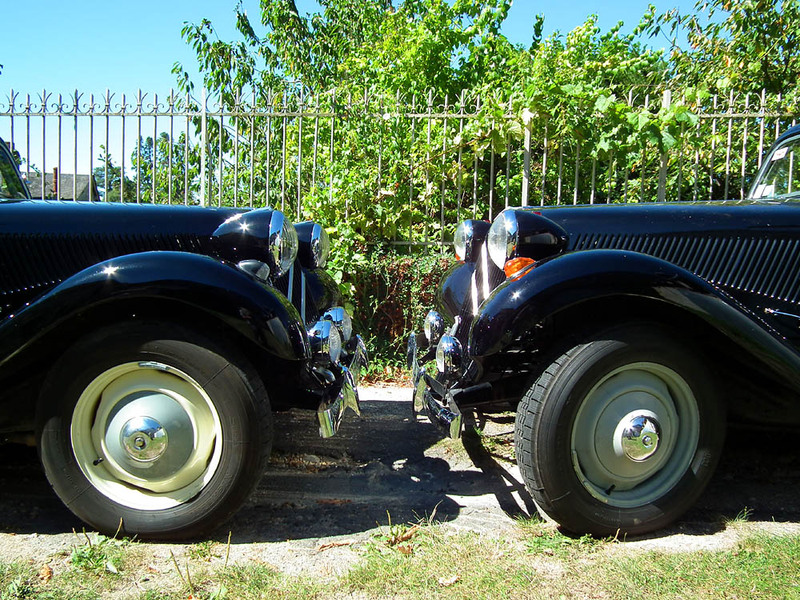 Across the road from the winery is a barn which houses his father's collection of vintage vehicles and an exhibition which changes annually. 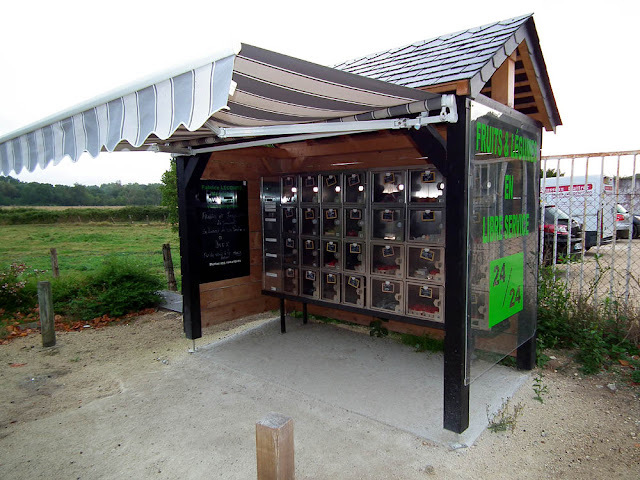 He has also built a visitor centre where you can taste and buy the wines from the estate. 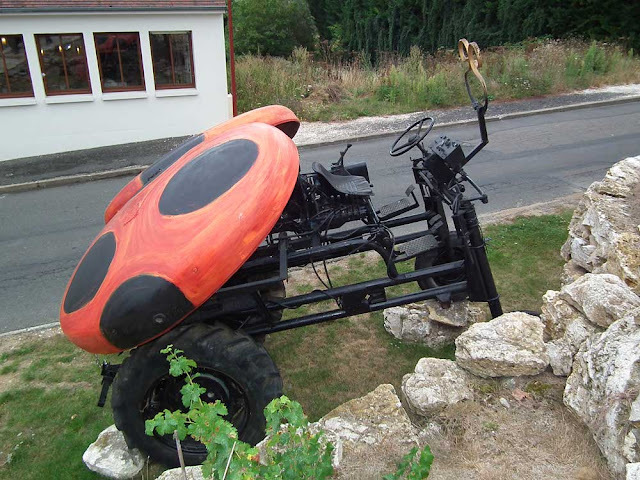 One of several whimsical bug-tractors around the estate. Vincent himself is personable, friendly and keen to tell visitors his story and about the vineyard and the wines. Like all the winemakers we know he is happy to spend a good hour with visitors, educating and exchanging information. Of course, it's best to make an appointment if you want to be sure to meet Vincent himself, but you can also just drop in to purchase wine. 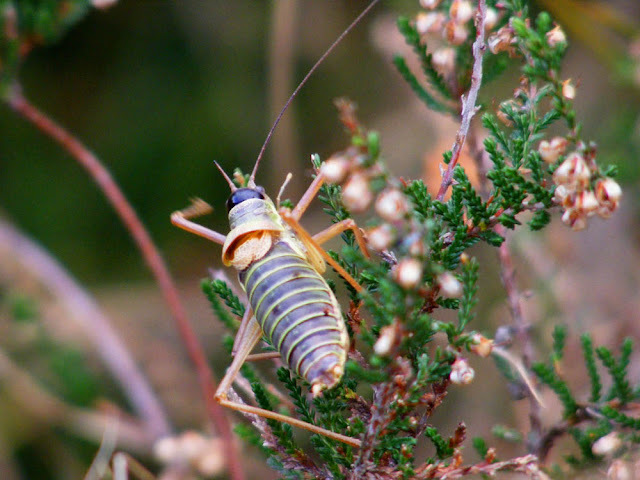 Keep an eye out in the late summer and all through the autumn for Bush-crickets. 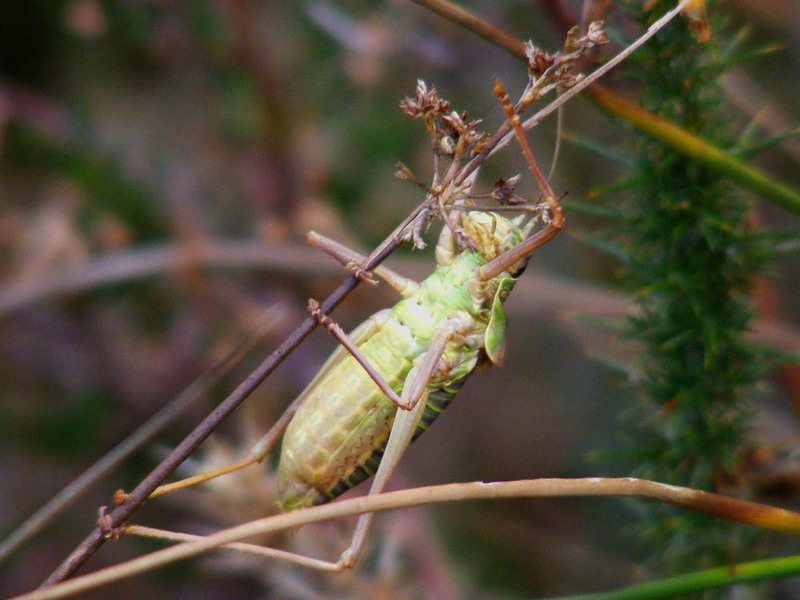 Good places to look are in amongst the vine leaves and in the besom heath scrub that is often allowed to persist in hunting reserves. 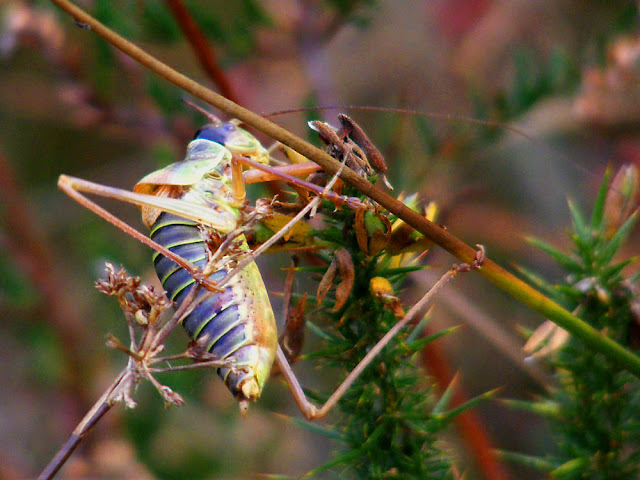 This one is Ephippiger ephippiger, a male. They are called le tizi in French, as that is what their chirrup sounds like. They are strange fat ponderous hunchbacked creatures, with abbreviated wings that are only used for stridulating, not for flying. 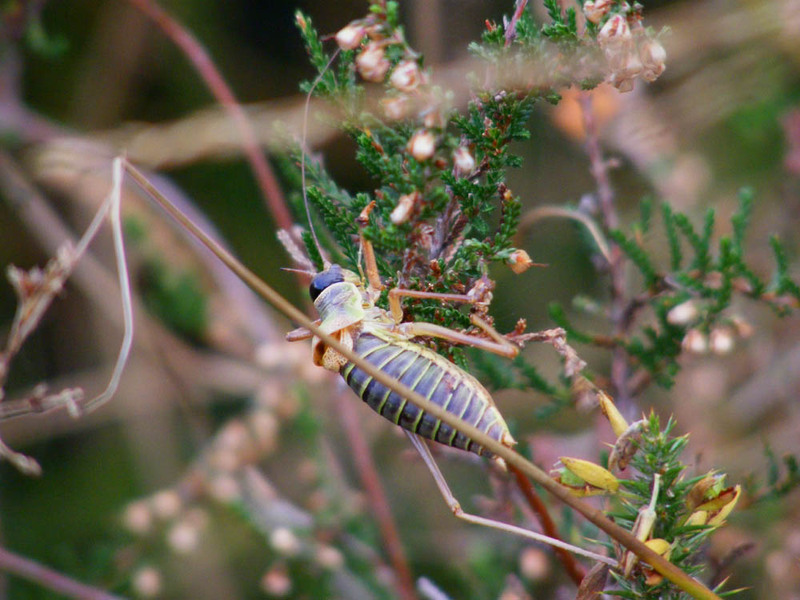 The one in these photos is male, lacking the sword-like ovipositor at the rear. 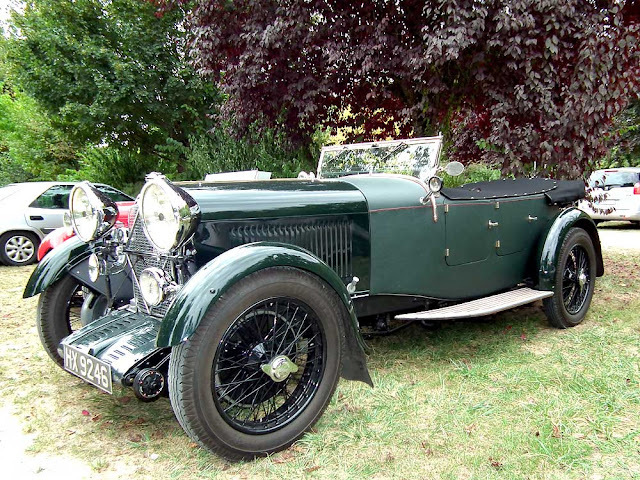 The Chateau of Chenonceau is a popular destination for vintage and classic car enthusiasts. These two Lagondas were spotted by Simon earlier this month. The red one is apparently a Rapier. 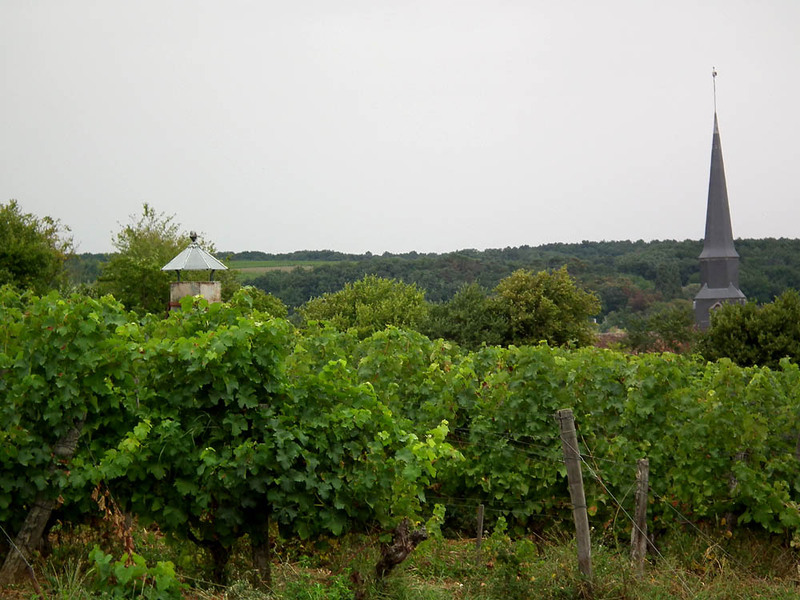 Domaine de Clos Roussely, overlooking the village of Angé. On our recent visit to Domaine du Clos Roussely in Angé, Vincent Roussely, the owner and winemaker, pointed out an unusual feature of the estate (on the left of the photo above). Looking up the chute from the cellar. In amongst the vines, looking rather like a chimney, is a structure installed by his grandfather. 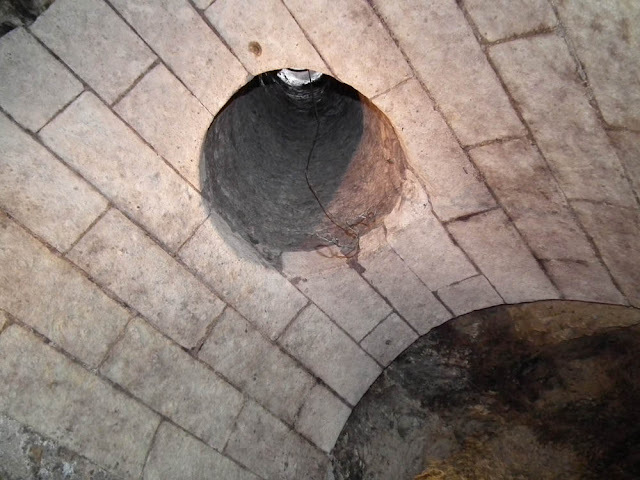 It is the top of a chute which goes through the roof of the chai (winemaking cellar). They still use it, and when the harvest starts (any day now) they will park the pneumatic press underneath. 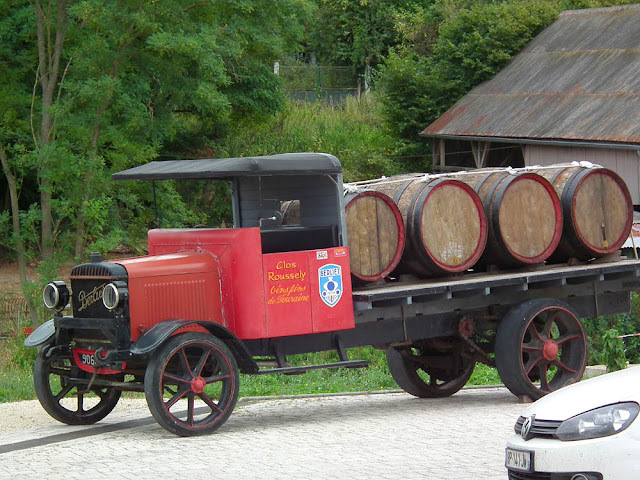 The grapes must have the shortest journey from vine to press of any winery in the Touraine I think. UPDATE: I have learnt that these chutes are called les jittes in French (from the verb jeter='to throw'). 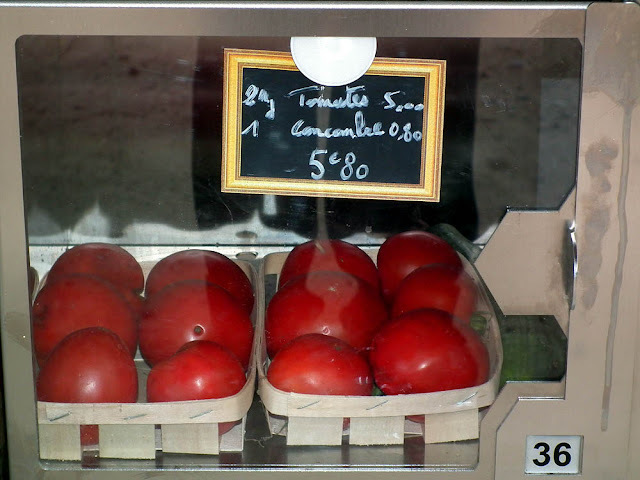 Rosemary has posted an explanation on Blois Daily Photo, which includes a most amusing sketch of how they work. Just as at its sister facility at Thallon, the Graincorp silos at Moree were working day and night to process the wheat harvest in early December 2012 when we drove into town. 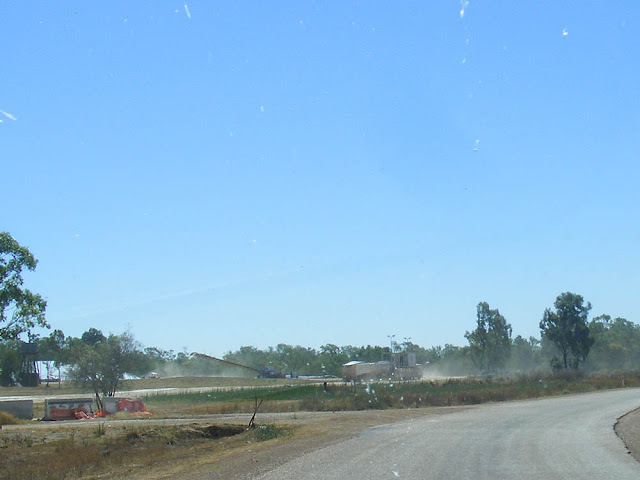 The 2011-12 crop Australian wheat crop was a record 29.5 million tonnes, but the 2012-13 crop is expected to be down significantly (government estimates were 22.5 million tonnes). 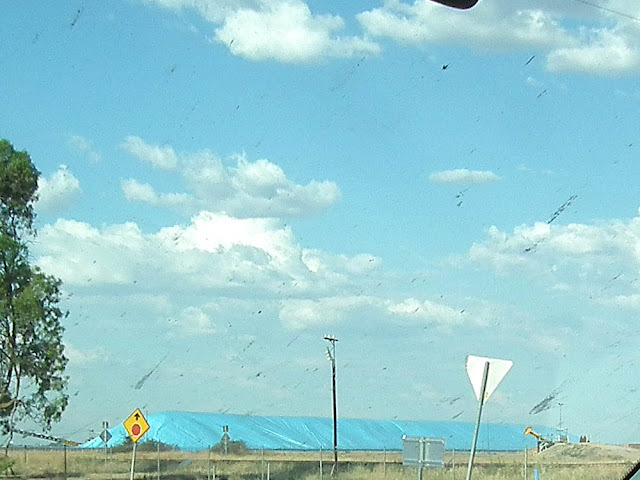 These blue tarps seem to be standard issue for protecting the big piles of grain. I found it quite disconcerting that they are not quite the same colour as the sky. We were astounded to discover that France beats Australia as a wheat producing nation by a country mile. Last year the French wheat harvest was 35.2 million tonnes and this year the estimate is for 38.24 million tonnes. France is the 5th largest wheat producer in the world and the 2nd biggest exporter. Australia is the 9th largest producer and the 4th biggest exporter. Another difference is that France is producing almost entirely soft wheat, whereas Australia, with its hotter, drier climate is producing mostly hard wheat. 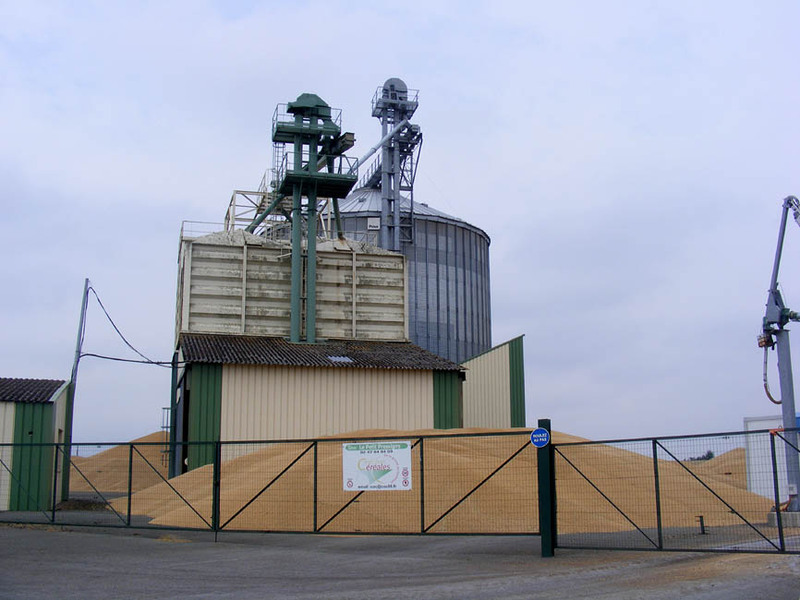 The total area under wheat in France is just 9 million hectares but the average yield is 6.15 tonnes per hectare. In Australia, 12.25 million hectares are planted with wheat. Over half of that area is in Western Australia and New South Wales. The yield varies wildly, depending on which state you are in, with the relatively tiny Tasmanian crop giving 3.5 tonnes per hectare on average, whilst in New South Wales they frequently don't even reach 2 tonnes a hectare. 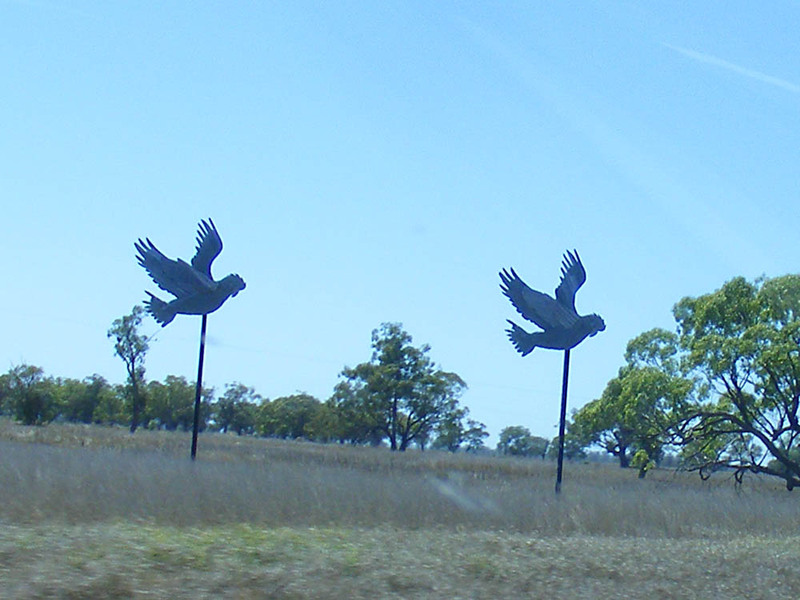 Overall, the average yield in Australia is around 1.5 tonnes per hectare. It really gives you an insight into how much growing conditions in the two countries differ. 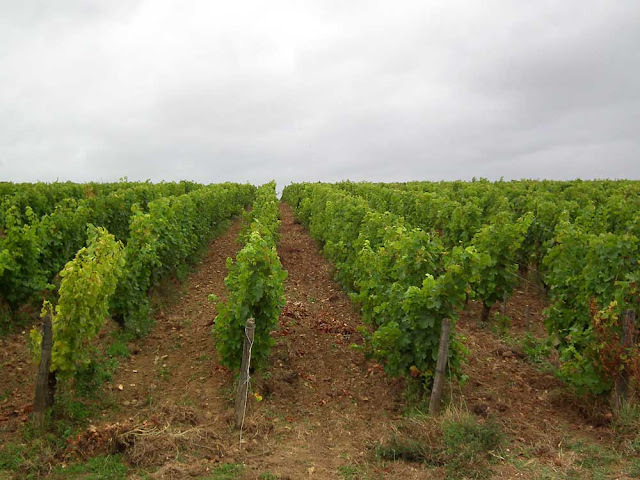 In general French soils are deep, fertile and alkaline. Rainfall is even and reliable enough. Australian soil is poor, shallow, acidic and lacking in phosphorus. Rainfall is sporadic and unreliable. Wheat is too often grown on marginal land. It makes you wonder how the country got a reputation (amongst Australians anyway) as one of the big wheat producers, with only wool to rival it in importance as an export crop. Ile de Ré Reflections - baigneurs et bagnards: The isle of Ré is the happy destination of hundreds of French families on holiday enjoying the sun and sea. It is also the site of France's largest maximum security prison (maison centrale), situated in the town of Saint-Martin-de-Ré, within the forteress walls designed by Vauban. 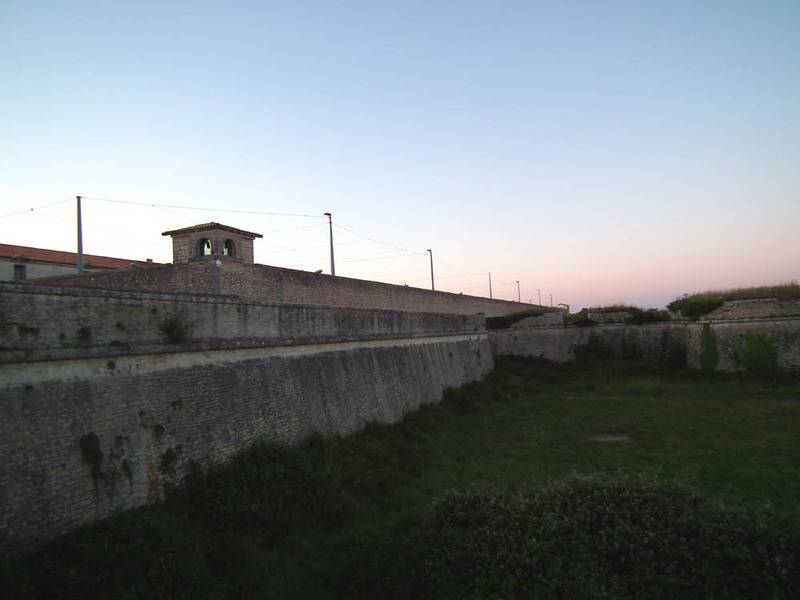 The fort was always intended to be part prison, and the facility has places for 500 prisoners. Currently 485 are occupied, a quarter of them by those serving long terms, and the prison (bagne) is the island's biggest employer (over 10% of the population work there). Until 1938 the prison acted as the departure point for prisoners being transported to the prison colonies in Guiana (including Devil's Island) and Vanuatu. Amongst those who went through Ile de Ré was Alfred Dreyfus. This is the Graincorp facility at Thallon in western Queensland. I took this series of photos because I wanted to show the scale of the site, but I don't think I've really managed to get it across. 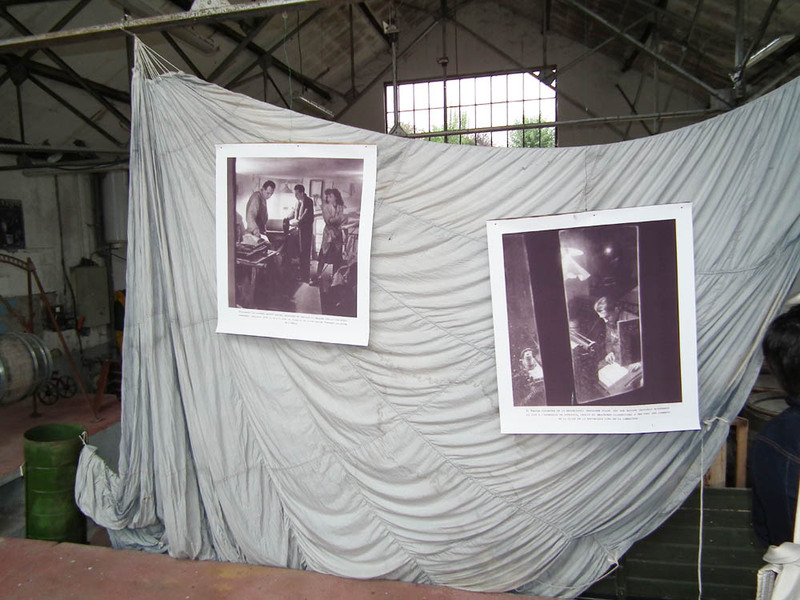 I wanted to show the huge tarpaulin covered piles of grain, the roadtrains like worker ants servicing the silos and the clouds of dust. It's quite a contrast to the small, neat, tightly contained grain silos you get around Preuilly. You get glimpses in these photos, but I just never seemed to be in the right place at the right time. 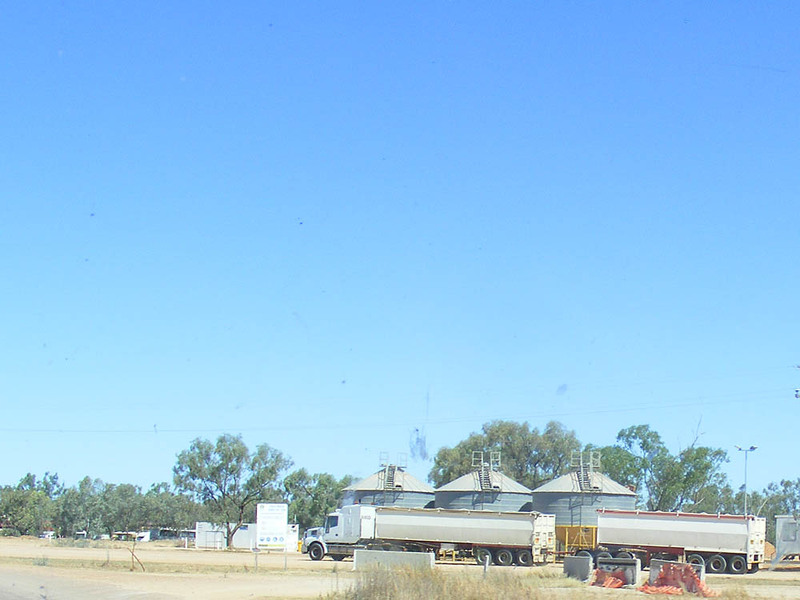 Graincorp is one of the few agribusinesses in Australia to be listed on the stock market. Traditionally, farming does not fare well with shareholders, as their outlook is too short-termist. Most agribusiness is in the hands of family trusts or co-operatives. Graincorp has a near monopoly on the storage and movement of grain in eastern Australia, with 280 sites across 3 states. Originally they were a government agency, but were privatised in 1992 and listed two years later. 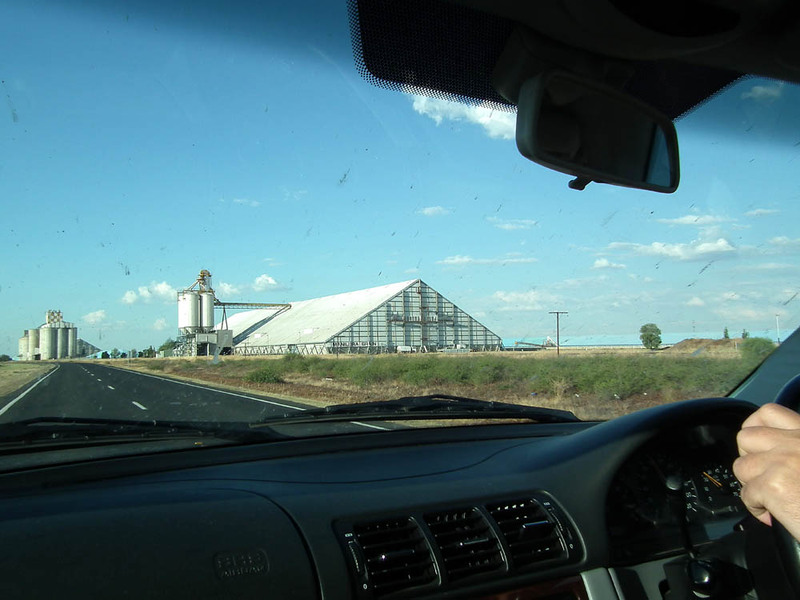 They have capacity for 20 million tonnes of stored grain in Australia. 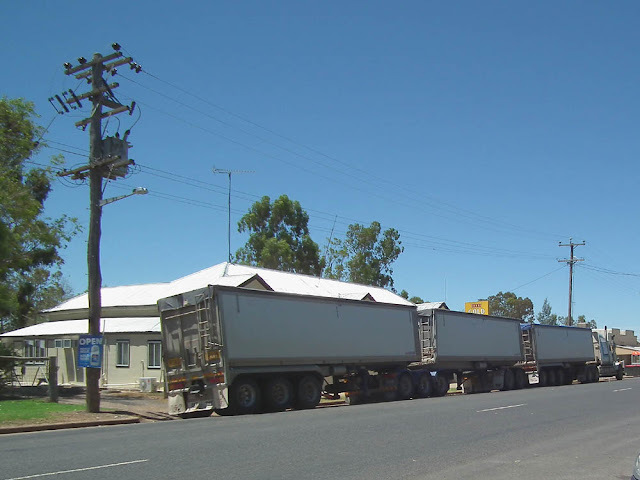 It comes in to depots like this by roadtrain. 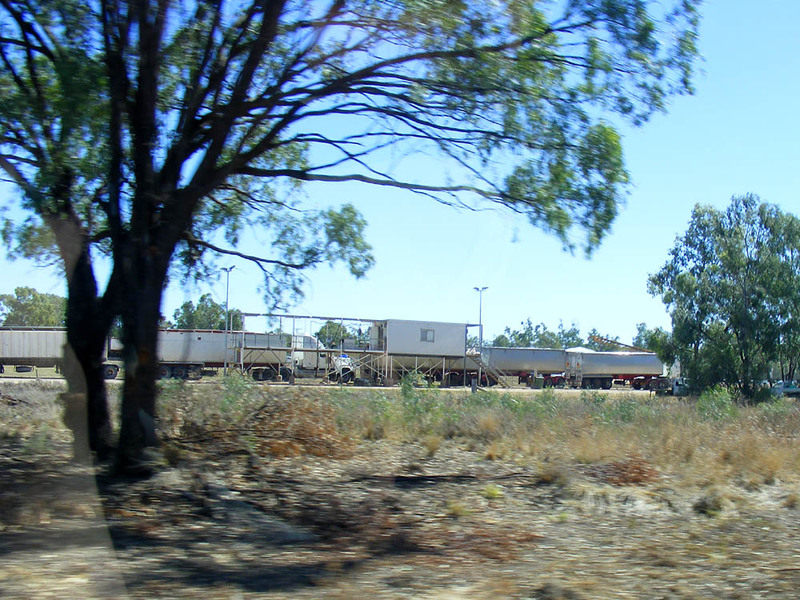 There is a railway siding on the facility, so much of the grain leaves by rail, but some continues its journey by road. Some is destined for the domestic market, some is exported. 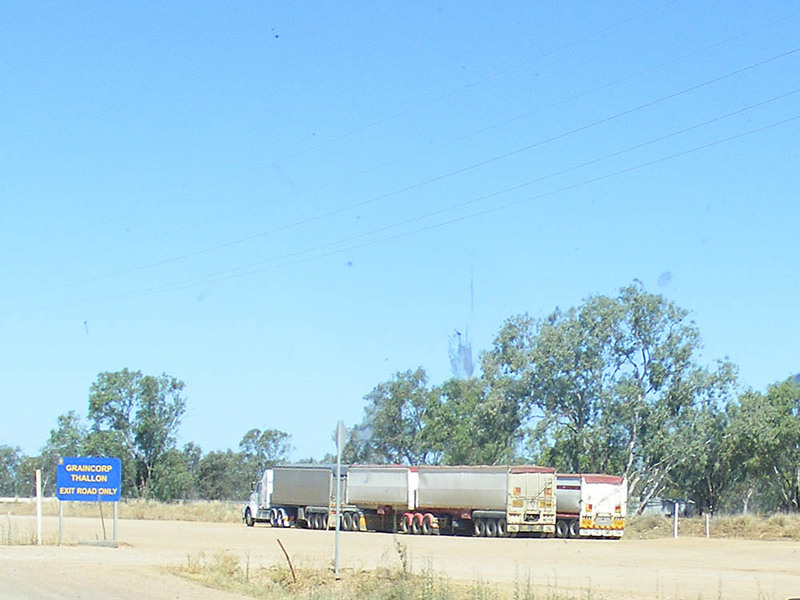 The Australian wheat market has been completely deregulated since 2008, and Graincorp is expected to be the subject of ongoing takeover bids by American based companies. 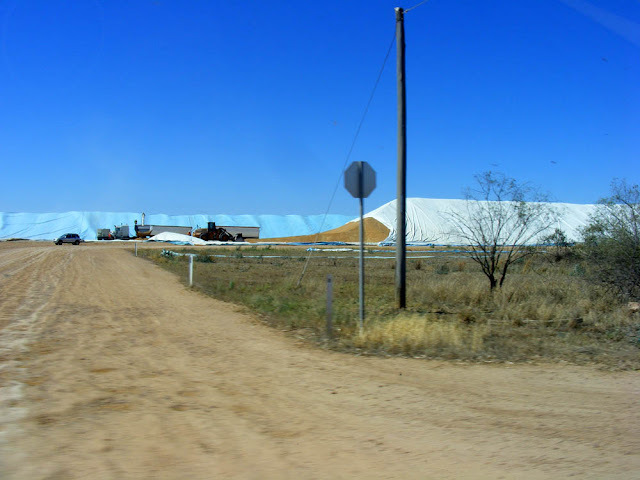 "GrainCorp charges for storage and handling by the tonne, and takes a percentage of gross value when it sells grain on growers' behalf. To an extent, GrainCorp's profits are not directly linked to grain prices - although that has not stopped its shares tracking wheat prices historically. But grain yields vary wildly from season to season: GrainCorp's record country grain receival of 14.9 million tonnes in 2010-11 was more than double the previous year's 7.4 million tonnes. The low point over the past decade was 2.3 million in the drought year of 2006-07." Ile de Ré Reflections: One of only two original entrances to the fortified port town of Saint-Martin-de-Ré. 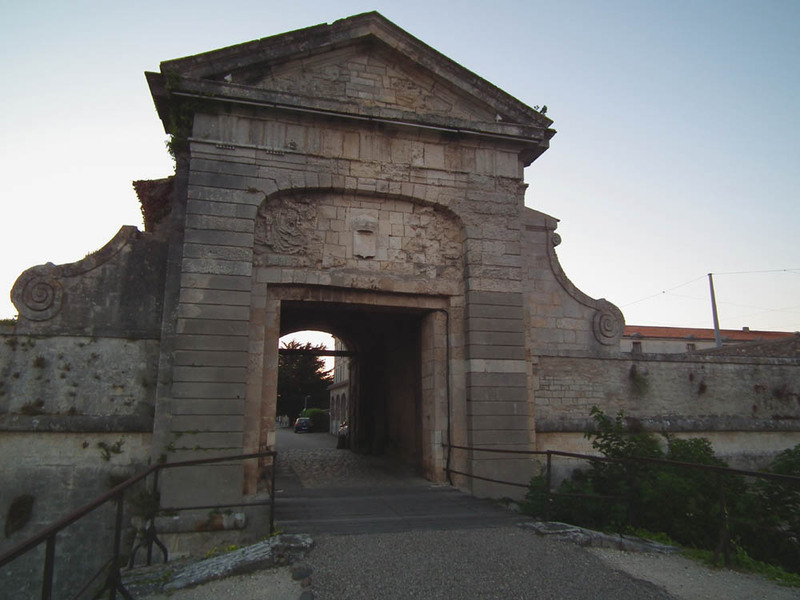 Nowadays, a new road has been cut through the ramparts and the old entrances mainly take cycle traffic. The original bridge was a counterweighted bascule. A Yellow Meadow Ant alate shakes off a worker from another nest. Every year winged Lasius spp ants emerge from their nests in the ground and form subtle shifting clouds above the trees with their mating swarms. The books all refer to this as occurring in July and August, but my observation is that late September is the moment in the Touraine - just in time to feed hungry swallows fattening up for their imminent and epic return to Africa. 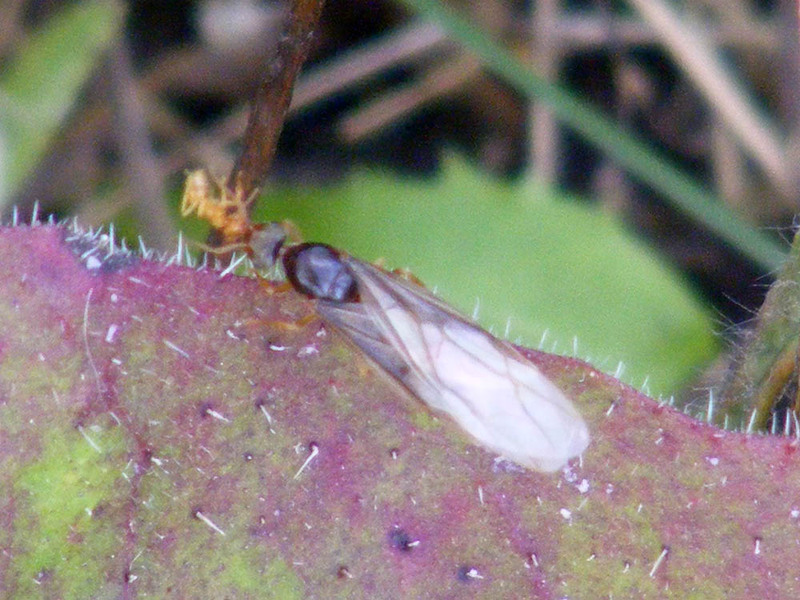 These flying, sexually mature ants are referred to as alates. 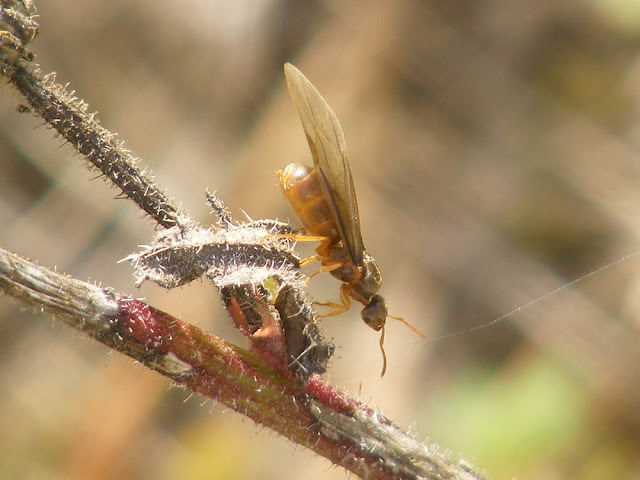 A Yellow Meadow Ant alate (queen). Yellow Meadow Ants L. flavus, like their cousins Black Garden Ants L. niger are very common here. As their names suggest, Yellow Meadow Ants are yellow(ish brown) and live in meadows (or any rough grassland, like our orchard) and Black Garden Ants are black and like the fine tilth of garden soil. Black Garden Ants are the ones that come inside in the spring if it's wet too. Both species 'farm' root aphids underground for their honeydew, and eat the adult aphids in the winter. Apparently Yellow Meadow Ants will also host Chalkhill Blue caterpillars in their nests. One of the ways of confirming ancient natural pasture is the presence of Yellow Meadow Ant nest mounds in the field. The mounds build up over decades if the land is undisturbed by ploughing or mowing. Orchard News: I picked the Doyenne de Comice pears yesterday -- best crop ever. They are small, but no sign of disease or infestation. I hope they ripen nicely in their wooden box in the kitchen and are ready in about 10 days when I have time to deal with them. I also picked some Melrose apples, a huge bucket full which hasn't even made a dent on the crop. The Black Hamburg grapes aren't quite ripe yet and the hazelnuts could probably do with a few more days. I picked a few tomatoes and a chilli, which will be our one and only. Orchid News: My friend Alice rang yesterday to say that the Autumn Lady's Tresses Spiranthes spiralis in her lawn were up and flowering! Last time I looked there was no sign of leaf rosettes, much less budding flower stems. They have clearly responded almost instantaneously to the 50 mm of rain that fell on Saturday. I am also pleased to see that the orchid seed pods in the orchard, including those of the late flowering Broad-leaved Helleborine Epipactis helleborine, have all split open and distributed their seed. Next year could be exciting! A la cuisine hier: Potager Pie -- that's basically Cottage Pie, but with about a 4:1 ratio of vegetables to meat. Probably also known as Fridge Pie. You can use any veg you like, especially if it needs using up, and the mash on top doesn't have to be just potato. Also good for sliding unloved veggies past the fussy eaters in your household. Sadly, none of the veg I used was actually from our own potager except the potato. Green Vegetable Soup -- that's another one for clearing out the fridge. Just sweat any green vegetable you have hanging around, add vegetable stock and a couple of diced potatoes, simmer for a while then blitz. Poached Pears -- the Beurre Hardy and Nashi pears picked a week ago, poached in syrup infused with vanilla, lemon, cinnamon, cardamon and pimento. This technique has the added bonus of giving you not just poached pears, but lots of flavourful poaching syrup which can be turned into sorbet. Apple Jelly -- quite a firm set as made with slightly under ripe windfall apples. In other news, Chateau Gaudrelle (Vouvray) tell us that they are harvesting from 10 October -- their latest ever harvest. Christian Davault from Domaine de la Chaise (Touraine) says he will be harvesting next week, which is his normal time. 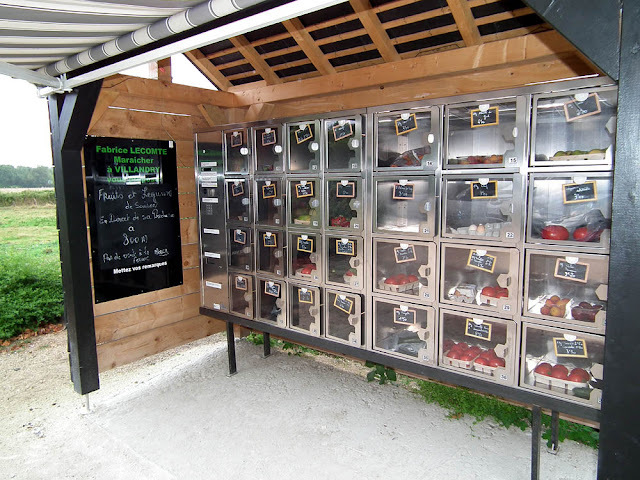 Some time ago the market gardeners from Villandry who have a stall at Loches market told me they had a vending machine in Villandry for selling their produce at the farm gate. Until the other day I had not spotted it, and it isn't really at the farm gate. 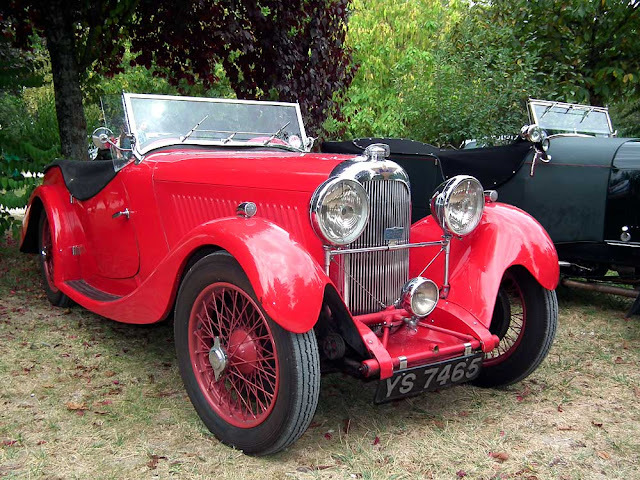 Its location is considerably more prime -- it is in the Tourist Office carpark. The veggie vending machine is a brilliant idea. Everything looked in good condition, and not outrageously expensive. I hope they do extremely well out of it. 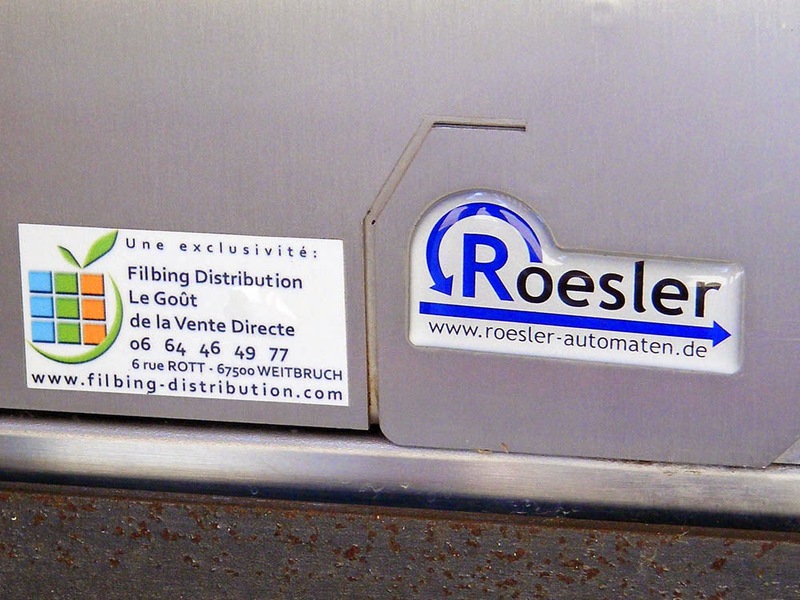 Update: Here is a photo of the labels on the machine, showing the French distributor and the German manufacture's details. A British parachute is used to display some photos of underground printing operations during World War Two. The chute is blue to camouflage it because it was used by someone dropped at night. 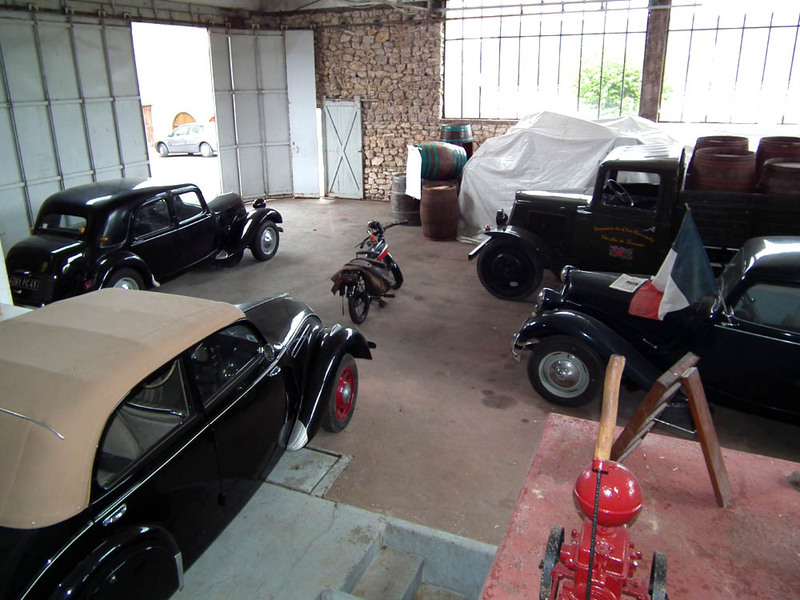 Vincent Roussely, who is a young wine maker we enjoyed visiting recently in Angé, has had an exhibition this summer about the French Resistance and wartime imprimeries clandestines in the building across the road from his impressive winemaking facility. I imagine it is no coincidence that since his father is a collector of old vehicles, they feature prominently in the display. The underground printers produced newspapers that gave the French people an alternative to the German propaganda. Somehow they managed to source the necessary paper and ink, and distribute the newspapers secretly. 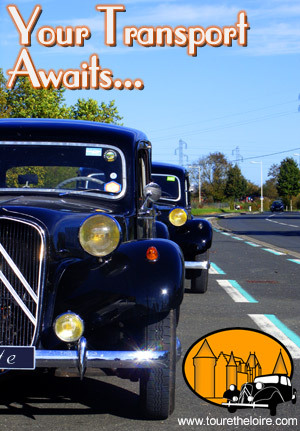 Hunting Season: The general hunting season starts at 9am on Saturday 22 September in Indre et Loire. The opening and closing dates for hunting each species in each département are set each year by the prefect after consultation with the Departmental Council for Hunting and Wild Fauna. The season will end on the evening of 28 February 2014. For details of specific opening and closing dates for all species, check the Hunt Federation website. Local hunt associations have contracts with their local communes, renewed every 5 years, and the hunt is allowed to access most land, whether in public or private ownership. If you wish to withdraw your land officially from being accessible to the hunt you must fill out the appropriate form at the mairie and provide documents such as your deed. After this has been processed the ban on hunting on your land will not take effect until the next time the 5 year hunt association contract is renewed. This year in Indre et Loire hares and pheasants may not be hunted except with special permission, in order to allow numbers to build up. A limit has been put on the numbers of woodcock hunters can take for the same reason. As a general rule you are not allowed to hunt at night or in the snow (although there are some exceptions). 2 points to anyone who can tell me which is which. 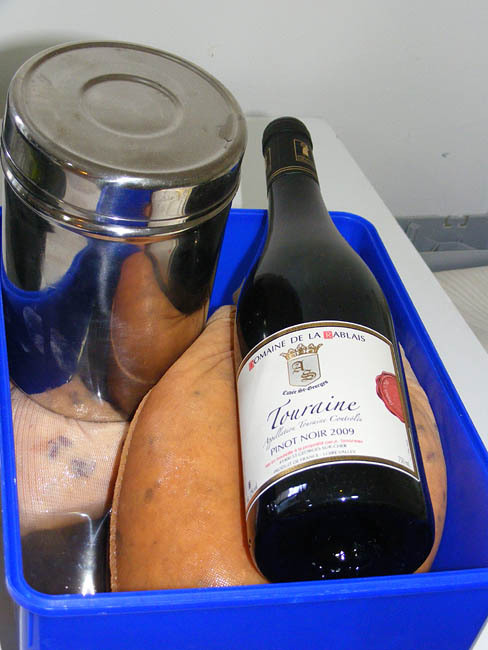 A box of quinces from our orchard neighbour, from 2011. 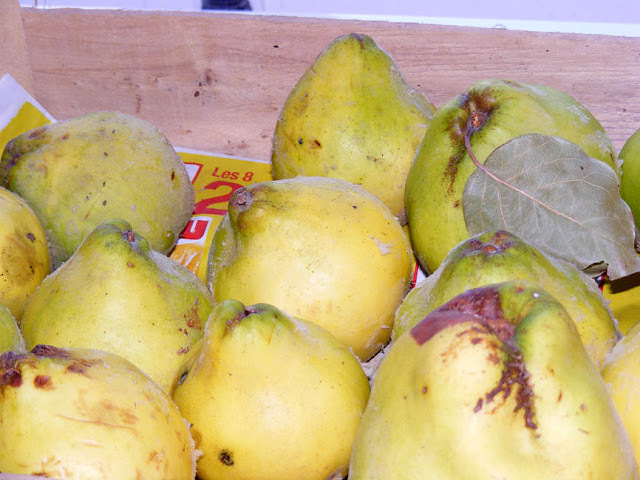 Quinces will be in again soon, and if you live in the Touraine and don't have a quince tree - don't worry - someone will offer you a bucketful of quinces. Quince trees seem to be loaded almost every year, and they are a sadly under utilised fruit. 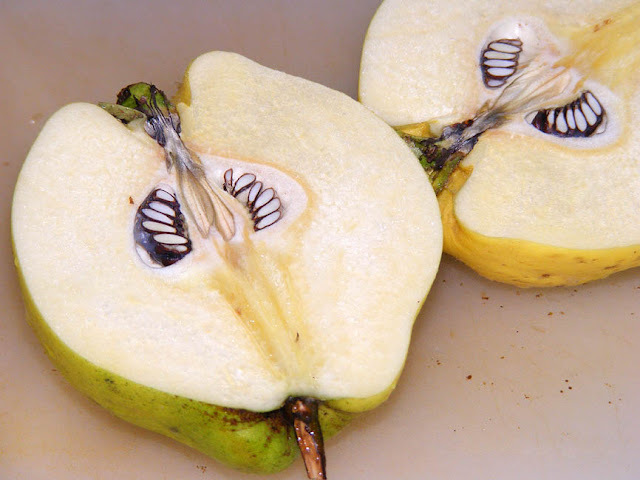 Cut in half, it is obvious they are related to apples and pears. Gélée de coings, as quince jelly is called in French, is one of the easiest and most reliable jams you can make. Quinces have so much natural pectin there is never a problem with set and because you strain the liquid from the solids for the end product, there is no fiddling about peeling and coring the fruit. Chop them up as roughly as you like. poached for dessert. The longer they poach the pinker they will get. I start by washing them and rubbing the fuzz off. Then I cut them into largish chunks. 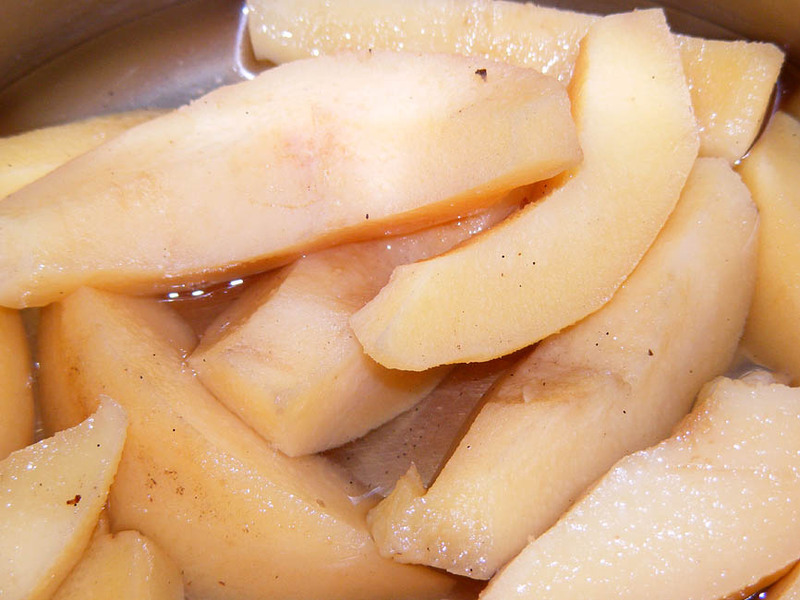 Combine the quinces with an equal quantity of sugar and set aside in the fridge for a couple of days. Follow the same method as for apple jelly. 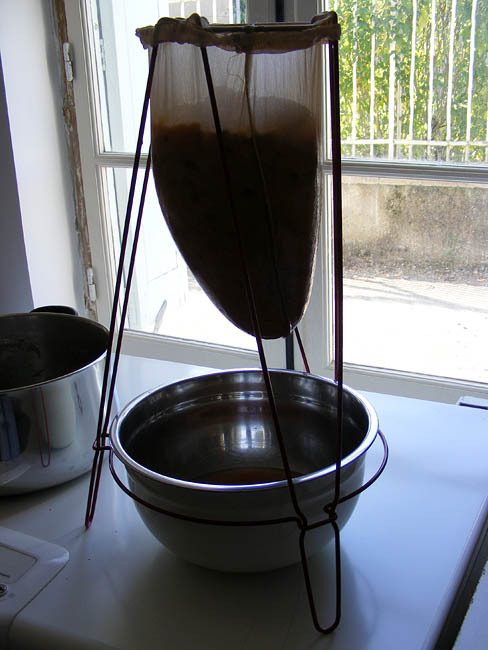 straining under the weight of quince pulp. Once you have made the jelly and have a bag full of pulp, pips and skin, don't throw it out. Run it through a food mill to extract the pips and scaly bits and make quince paste with the resulting pink purée. Pressing some more liquid out of the bags of pulp. It is important to use a good quality wine for this. The Coronation Hotel, Toobeah, a typical bush pub in a tiny town in the middle of nowhere. We arrived at lunchtime and thought we might as well try them. They had lots of signs on the roadside announcing they did food all day and you could shower there. There was no alternative in town and the next town in the direction we were going is 2 hours away. They sold lots of different beers, but very unusually, none of it was on tap. There were 'tallies' in the fridge, ready for sale in neat newspaper wrappers (presumably you can't get insulating neoprene tallie holders) and a large range of European and Australian beer in 'stubbie' sized bottles. The publican told us his son is a professional rugby league player, and lives in Carcasonne! 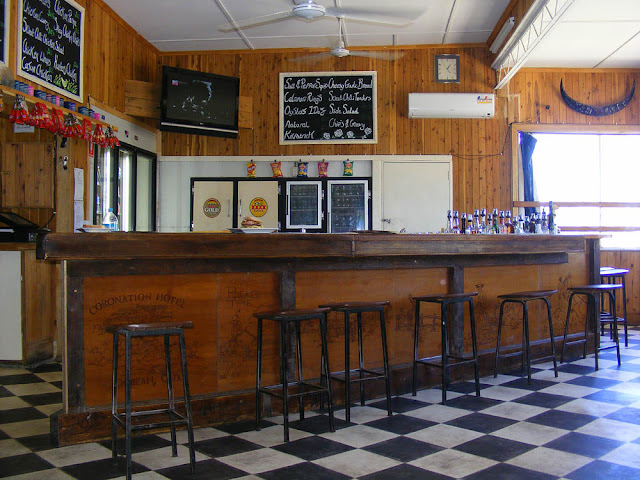 The television over the bar was switched to SBS (Australia's multicultural public broadcasting station) and showing a French music video show! The food turned out to be excellent -- if you knew what to order. I had a steak burger, a good choice. Simon had salt and pepper squid. This turned out to be a bad choice, but he had gone for them because they appeared on every bush eating establishment menu we saw. He suspected they would turn out to come out of a packet, and they did, but felt he had to try them at least once as they were so strikingly ubiquitous (and a culinary fad that has occurred since we left Australia, so was new to us -- the fad, not the dish...). The driver of the road train above phoned in his order from a few miles down the road. That's his burger sitting on the bar, ready for his arrival. Contract harvesters and cotton picking crews in the area are likewise invited to phone their orders in or radio ahead (a uhf radio sits behind the bar for such services). You can even message them on Facebook! 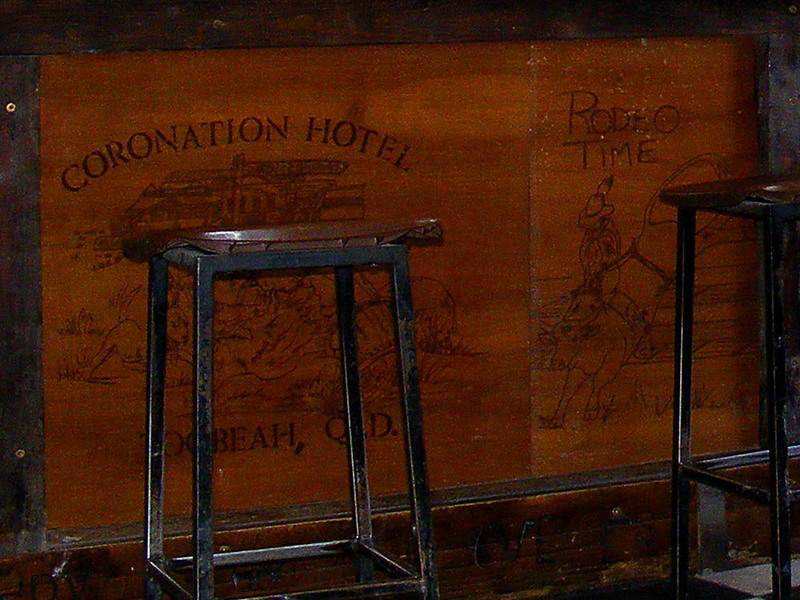 A bit of a shame that the rather good poker work on the bar is obscured by the stools. 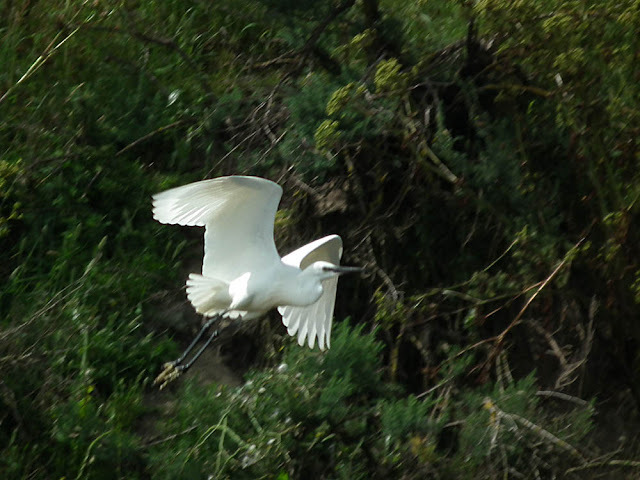 Ile de Ré Reflections - A Bird Back From the Brink: Little Egrets are common now in the Loire Valley and on Ile de Ré where we recently went camping. Happily this is a bird that has made a wonderful comeback, after almost being hunted to extinction in Europe. They are apparently tasty and were eaten in vast quantities in medieval times, plus they have pretty white plumes, just the thing for decorating a 19th century hat. Numbers reached an all time low in the first half of the 20th century, but in the 1950s France introduced laws to protect and conserve them. Within a couple of decades the numbers were clearly recovering. They are the same species as in Australia, and can be identified by their fashion victim combination of black legs and yellow feet. This one was photographed by Simon on the LPO reserve on Ile de Ré in July. 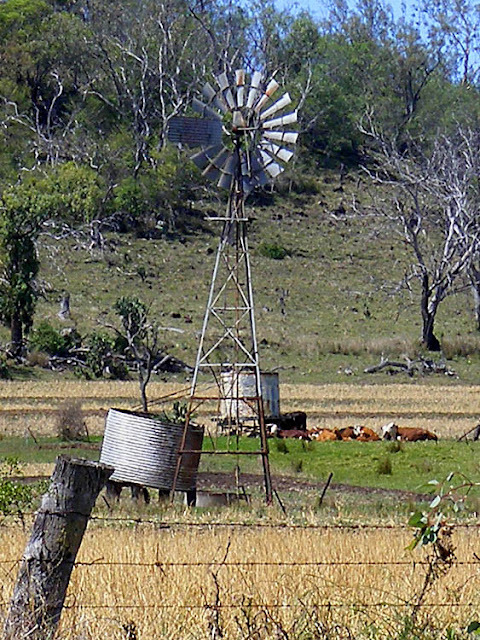 Another Aussie icon -- the windmill -- especially if it is made by a company called Southern Cross. 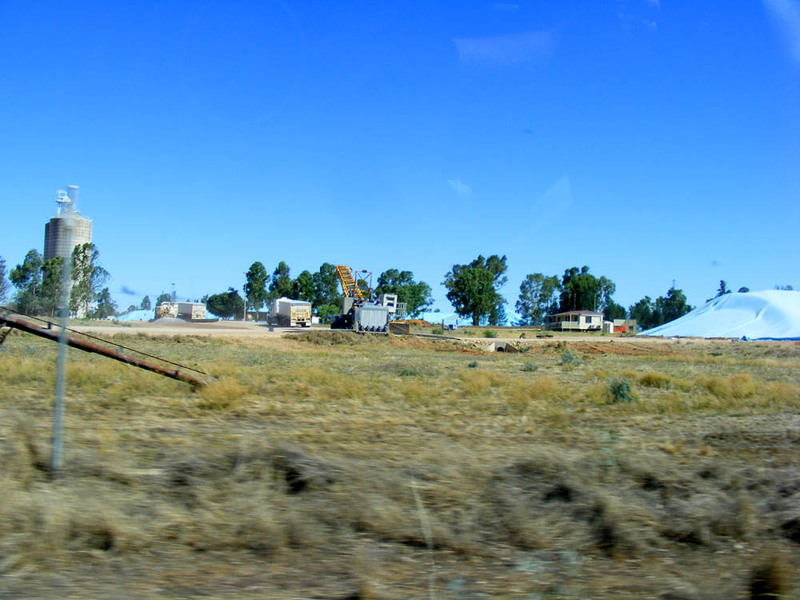 Underground and artesian water is very important in Australia, and the survival of both stock and man depends on being about to reliably pump water. These utilitarian wind powered water pumps are everywhere in rural Australia. They may not be as snazzy as the éoliennes Bollée in Indre et Loire, but they do the same job. They are ideal for remote locations as they are robust, simple technology that requires little maintenance or expertise to erect and run. 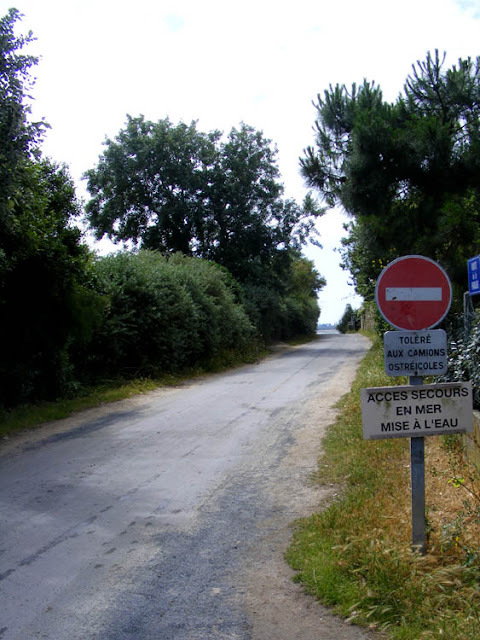 Ile de Ré Reflections: This road sign demonstrates an interesting quirk of French law. The road is designated as not accessible to vehicles except for emergency access to the boat ramp. However, oyster farmers' trucks are officially and openly 'tolerated'. This means that so long as they behave reasonably the oyster farmers can come and go to their oysterbeds via this road, but they do not have a legal right of way and the local authority has the right to withdraw their access at any time. Sometimes there will be an additional rider to these signs, saying that the road is not accessible except for residents (sauf riverains). This indicates that, unlike the merely tolerated oyster farmers, the residents have a right of way.